Here are the photos I'm currently exhibiting at the Clifton Park-Halfmoon Public Library, through the auspices of the Saratoga Arts Art in Public Spaces program. The exhibition runs from January 31 through February 24, 2019. Thanks to Emma Huneck of Saratoga Arts for making this opportunity available to me, and to the staff at the Clifton Park-Halfmoon Public Library for making me welcome, and for providing assistance while I mounted the display. I have been a photographer since I was a child, growing up in England. Since retiring from a career as a university professor in the School of Education at SUNY-Albany, I have devoted more time to photography, and started entering art competitions in 2017. I have had photos displayed in local member and juried exhibitions (Saratoga Arts, LARAC, North Country Arts, Paul Nigra Center); and in regional juried exhibitions (Golden Thread Gallery, West Hartford, CT, West Hartford Art League’s CT+6). I have an ongoing display at Saratoga Health and Wellness on Maple Ave in Saratoga (these are also on my website). My primary interest has been nature photography, but I’m increasingly drawn to more abstract compositions even though they tend to be embedded in naturally occurring situations. I like photographing beautiful objects and scenes, but much of my current work aims to create photographs that don’t just reflect the beauty of nature but also provide some ‘mystery’ to them. Want to visit? The Library is situated at 475 Moe Road, Clifton Park, NY 12065. 1. Dinosaur. iPhone7+. Saratoga Springs, NY, 2017. Canvas Photo, 20" x 16”. 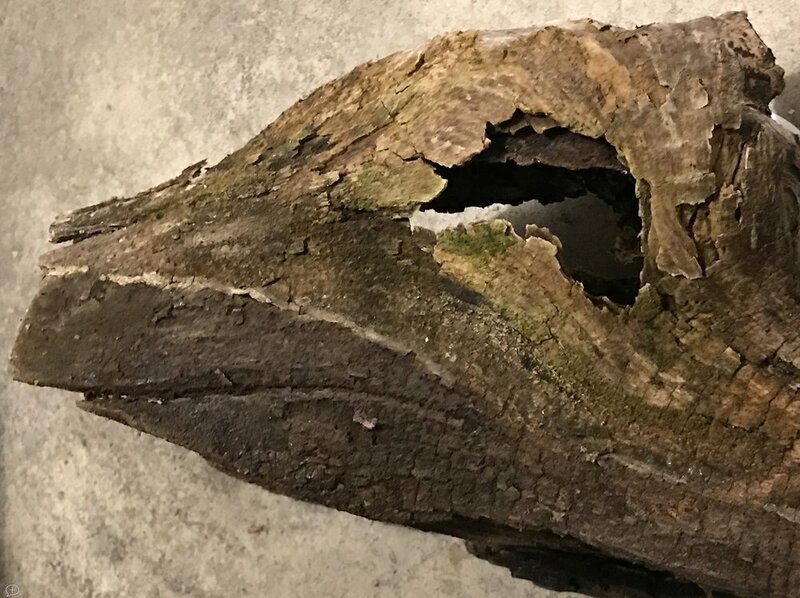 This photo is just a piece of driftwood I found in an Adirondack stream. But it surely has the look and feel of a dinosaur! 2. Face in a River Rock. iPhone 6S, Yorkshire Dales, UK, 2016. (Canvas Photo, 16" x 20”). Visiting Yorkshire in May, 2016, I came across this rock in the River Ure, near Aysgarth. Only later did I realize there was a face in it. 3. Crabapple Berries. iPhone XS, 2018. Saratoga Springs, NY. ( Canvas Photo, 40" x 30”). This photo was taken right next to the shared mailboxes in my neighborhood. These berries are so juicy this year! 4 .A Winter Leaf. iPhone XS, 2018. Saratoga Springs, NY. (Canvas Photo, 20" x 16”). I’m particularly fond of photographing nature up close, and this leaf blew into my garage last November, so I held it up against a wall, with the shadow of a shade behind it. 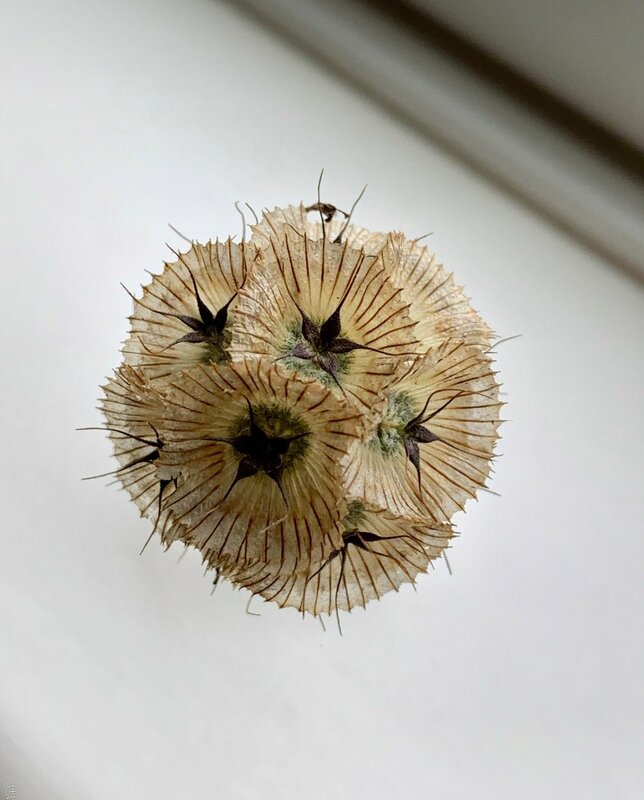 5 .Dried Scabiosa Flower. iPhone XS, 2018. Saratoga Springs, NY. ( Canvas Photo, 16” x 20”). This flower measures less than an inch in diameter, but a close-up reveals such beautiful colors and patterns. 6. Reflections in my Pond-1. iPhone XS, 2018. Saratoga Springs, NY. Canvas Photo, 18” x 24.”). In this photo (turned upside down, so the trees look the right side up), you can see feint images of the rocks below the surface, as well as ice—built up in layers, as well as clear. 7. Reflections in my Pond-2. iPhone XS, 2018. Saratoga Springs, NY. (Canvas Photo, 18” x 24.”). This photo, taken 10 days after the previous one, shows a much different view, more impressionistic. That’s snow frozen onto the surface, with ice barely hiding lily pads underneath. 8. Mass MoCA Columns Reimagined, 2018. North Adams, MA (Digital Collage, 36” x 12”). Mass MoCA is a contemporary art museum within an old factory. There are huge columns throughout, each originally painted black up to 4-5 feet, then cream above. This collage pays tribute to the old columns. 9. Soul of a Bird. iPhone X, 2018. Keen, NY. (Canvas Photo, 36” x 12”). This bundle of leaves, measuring only 2-3 inches across, was hanging from a maple tree outside a restaurant in Keene. Turns out it was a spider’s creation, made by weaving leaves into a trap for the unwary. My niece gave it its title! 10. Mass MoCA Walls Reimagined, 2018. North Adams, MA (Digital Collage, 36” x 12,”). Mass MoCA’s walls are also painted with dark colors at the bottom, and a variety of colors up above. So I made a collage of the walls, too. 11. Frozen Stream in Congress Park,2018. iPhone XS, Saratoga Springs, NY. (Canvas Photo, 40” x 30,”). This is a shot of the small stream that flows through Congress Park, near where a huge old tree was recently cut down. What drew me to the scene was mostly the grey ice contrasted with the brown leaves, but I also like the curved and sharp lines in the ice itself..
12. Snake in the Grass, Canon 80D, 2017. Saratoga Springs, NY. (Canvas Photo, 20” x 16”). I came across this ‘snake’ in the Saratoga State Park, it actually was a branch that dropped from a tree along the stream there. 13. Ice Man, iPhone 6S. Saratoga Springs, NY. (Canvas Photo, 16” x 20”). This photo is exactly as taken. If you look carefully, you’ll see that what looks like the body of a man is only the shadow of piece of ice left over from plowing the road near the Gideon Putnam Hotel. 14. Rock, Stone Hill, iPhone XS, 2018. The Clark Institute, Williamstown, MA. (Canvas Photo, 40” x 30,”). There is a huge boulder half way up to one of the galleries at the Clark. It had rained the day before, and the rock revealed rich colors in its veins. 15. Clouds on East Avenue, iPhone 7+, 2017. Saratoga Springs, NY. (Canvas Photo, 40” x 20,”). This photo was taken in September, as a fierce storm rushed through the city, bringing with it a huge cloud, set against a clear blue sky. I just happened to be there when it passed the Fasig-Tipton building on East Ave.
16. 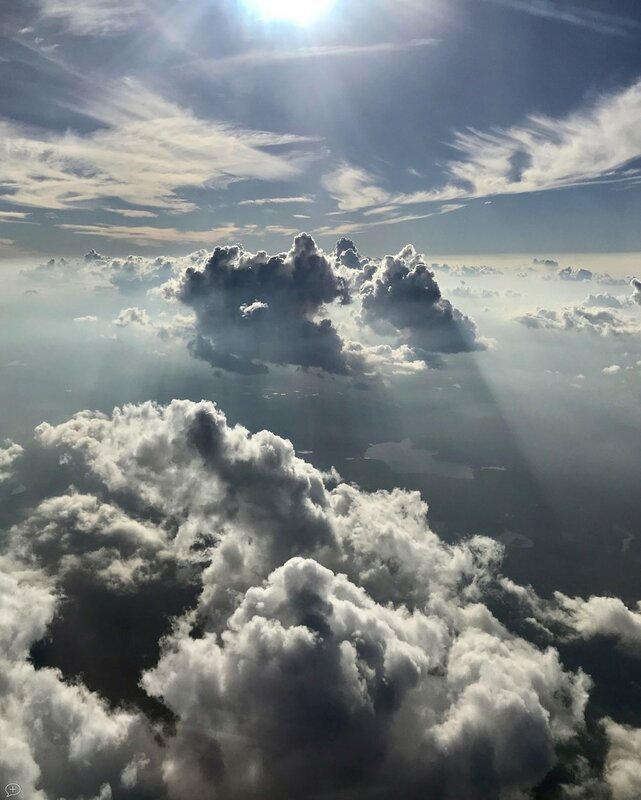 Clouds above the Appalachians, iPhone 7+, 2017. En route to Philadelphia. (Canvas Photo, 16” x 20,”). I’ve flown this route many times, but never seen such a display of clouds above us and below. Needless to say, it wasn’t a smooth flight. 17. Sun Behind Clouds, iPhone 7+, 2017. Saratoga Springs, NY. (Canvas Photo, 16” x 20,”). As you probably have already gathered, I have a fascination for clouds—made legitimate through a membership of the British Cloud Appreciation Society. This one was shot from the patio at the back of my house. 18. Ice Tangle, Canon Powershot SD2000 IS, 2010. Saratoga Springs, NY. (Canvas Photo, 40” x 20”). Although icy conditions are brutal on walking and driving, they do provide great opportunities for photography, and I try to take advantage of them. 19. Pine Trees in Saratoga State Park, iPhone 6, 2014. Saratoga Springs, NY. (Canvas Photo, 16” x 20,”). In the winter months, the Farmers Market moves to the Lincoln Baths building in the State Park, and I try to get there early. When the sun is still low, and there’s frost on the trees, it makes for an eerie black-and-white photo opportunity. 20. Ice on my Front Steps, iPhone 6, 2014. Saratoga Springs, NY. (Canvas Photo, 16” x 20,”). Ice forms on the front steps of my house, when water drips off the porch roof. It solidifies into large blocks, reflecting the white railings, a tree right behind it, and even blue sky beyond. I just love the different textures and colors that the ice reveals. 21. Looking into the Abyss, iPhone 6S, 2016. Saratoga Battlefield, NY. (Canvas Photo, 40” x 30,”). 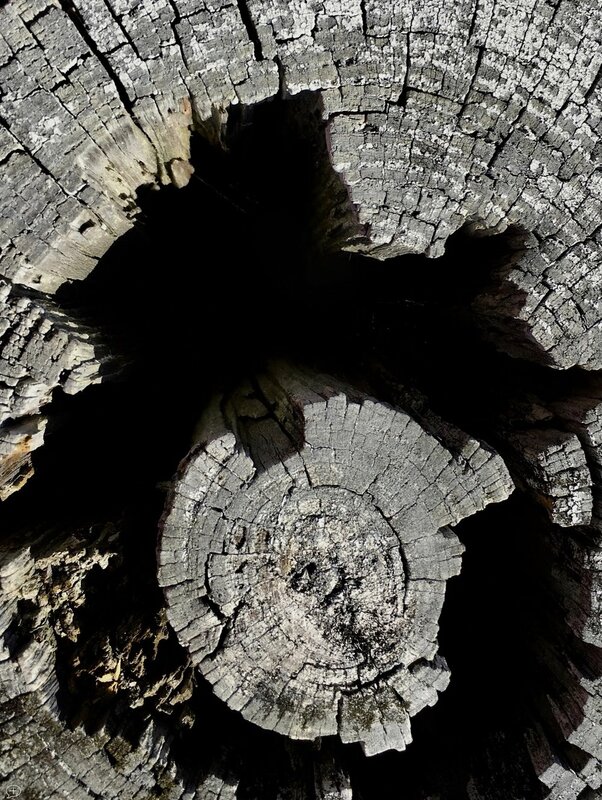 When I tell people this photo is only looking down into a stump at the Saratoga Battlefield, they often don’t believe me. But that’s what it is. Of course, what it looks like to a viewer is quite another thing! What does it remind you of?